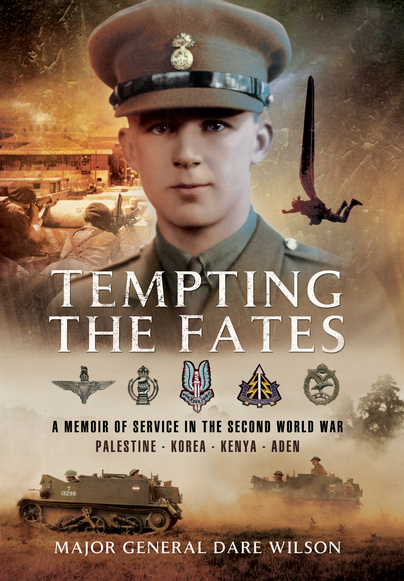 You'll be £12.99 closer to your next £10.00 credit when you purchase Tempting The Fates. What's this? General Dare Wilson saw action in France 1940 (Dunkirk), Italy and North West Europe (where he won his MC) with the Northumberland Fusiliers and later the Recce Regiment. He then served in Palestine and Korea which he rates as the most vicious war he fought in. He was picked to command 22 SAS and was responsible for basing them at Hereford. His account of the world record-breaking free fall jump free falling from 34,000 feet makes thrilling reading – one member died. He went on to fight the Mau Mau in Kenya and was in the last party to leave Aden when we withdrew in 1968. Dare then learnt to fly helicopters and commanded the fledgling Army/Air Corps. We believe that this is one of the most enthralling of the many superb memoirs we have published. Certainly it is the widest in its scope and makes for thrilling reading. The author served throughout WW2, from the BEF and Dunkirk to Germany, via the Middle East, Italy, France and the Low Countries, before being involved in Palestine and Korea. In addition, General Wilson CBE MC DL MA FRGS (1919-2014) saw action against the Mau Mau in Kenya and was among the last to leave Aden in 1967, as well as being one of the few British officers to witness the Vietnam conflict. The Royal Northumberland Fusiliers was his parent regiment, but the author also saw active service with 3rd Reconnaissance Regiment and went on to command 22nd SAS. After learning to fly both fixed wing aircraft and helicopters, he became Director of Army Aviation. Still finding time for a wide range of sporting activities he enjoyed skiing, the Cresta Run, shooting, fishing or parachuting and even his description of these pastimes adds to an already fascinating book which is modestly written. First published in 2006 and now reprinted in paperback format in 2016, these memoirs provide what can only be described as an amazing story about an amazing career.